Wild Water, a NetEnt slot based on the theme of surfing in the sixties. Ride the wave and enjoy all the bonus features on offer such as stacked symbols, multipliers of up to x200, and plenty of free spins. Players can win up to 400,000 coins while playing this slot. Wild Water slot has 20 fixed paylines, which means that players have to play them all. They can, however, choose to bet anywhere between 1 and 10 coins per payline, choosing from a coin value range of $0.01 to $0.50. Players will have to bet in the range of $0.20 to $100.00 per spin of the reels. If players want to bet maximum, they only have to hit the Bet Max button. 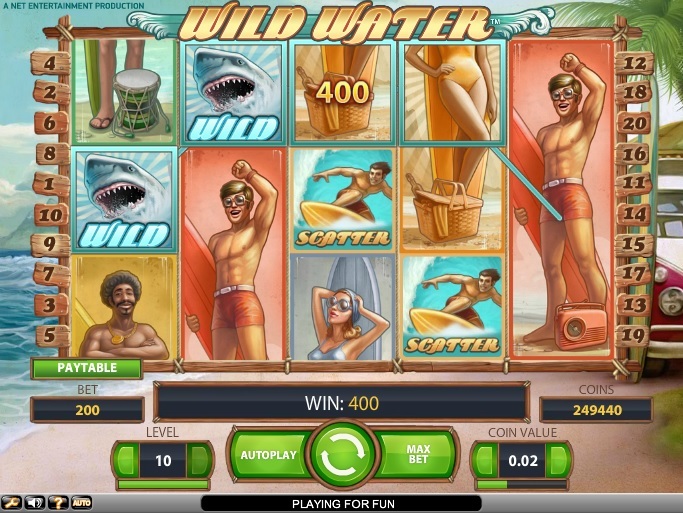 While spinning the reels of Wild Water slot, players are free to alter the game settings to suit their tastes and preferences. They can turn the sound effects on and off, view their gaming history, or use the Autoplay feature to spin the reels automatically. Wild Water is based on the “surfing in the sixties” theme, when the idea of having fun at the beach was totally different than what it is at present. The reels feature brilliant graphics and images and are set against the backdrop of sands, blue skies, and white-topped waves. While spinning the reels of this slot, players can view expert surfers in action. Since the slot deals with surfing in the sixties, it has a retro look and feel to it. The slot has so many bonus features that players can win up to 400,000 just by spinning its reels. The Shark icon is the wild, and whenever players land it on the reels, it expands all over the reels to increase players’ chances of winning. The slot is literally packed with five stacked surfer symbols, which players can use to unlock the game’s bonus features. When five Surfer icons appear on the reels, the Surf’s Up Bonus Feature, which is associated with a multiplier value of x20, gets activated. If players create a combination of five stacked Surfer icons, the Surf Team Bonus Feature with a multiplier value of x200 gets activated. The slot also has a free spins round, which gets activated as soon as players land at least three Surfer icons along the reels. If players land 3, 4, or 5 scatters anywhere on the reels, they will win 15, 30, and 60 free games, respectively. Launched in March 2014, Wild Water is a new slot that is yet to make its mark at NetEnt casinos. However, it is sure to attract a number of players because of its unique bonus features and the opportunity to win up to 400,000 coins. Currently, the slot is available for fun or real money at any NetEnt casino.